What is it? It is difficult even for an expert to define. It is estimated to be around and under the temperature of 70 degrees. However, this will vary in each case due to the specific circumstances and physical condition of the person involved. What Happens In Cold Water? Many of the fatal boating accidents occur in the “out-of-season” months when the water is cold. What happens to the body when suddenly plunged into cold water? The first hazards to contend with are panic and shock. The initial shock can place severe strain on the body, producing instant cardiac arrest, as happened to a 15 year old scout in the month of March in Pennsylvania several years ago. Survivors of cold water accidents have reported the breath driven from them on first impact with the water. Should your face be in the water during that first involuntary gasp for breath, it may well be water rather than air. Total disorientation may occur after cold water immersion. Persons have reported “thrashing helplessly in the water” for thirty seconds or more until they were able to get their bearings. Immersion in cold water can quickly numb the extremities to the point of uselessness. Cold hands cannot fasten the straps of a lifejacket, grasp a thrown rescue line, or hold onto an over-turned boat. Within minutes, severe pain clouds rational thought. And, finally, hypothermia (exposure) sets in, and without rescue and proper first aid treatment, unconsciousness and death. We all recall the incident in which the airliner went down in the dead of winter in the water in Washington, D.C. several years ago. The vivid video of the rescue attempts and those that died due to hypothermia is not easily forgotten. Normal body temperature of course, is 98.6. Shivering and the sensation of cold can begin when the body temperature lowers to approximately 96.5. Amnesia can begin to set in at approximately 94, unconsciousness at 86 and death at approximately 79 degrees. Cold water robs the body’s heat 32 times faster than cold air. If you should fall into the water, all efforts should be given to getting out of the water by the fastest means possible. Persons boating in the cold water months should be thoroughly skilled in rescue and self-rescue techniques. Most accidents involve small boats which with practice, can be righted and re-entered. Most boats, even filled with water, will support the weight of its occupants. If the boat has capsized and cannot be made right, climb on top of it. Physical exercise such as swimming causes the body to lose heat at a much faster rate than remaining still in the water. Blood is pumped to the extremities and quickly cooled. Few people can swim a mile in fifty degree water. Should you find yourself in cold water and are not able to get out, you will be faced with a critical choice – to adopt a defensive posture in the water to conserve heat and wait for rescue, or attempt to swim to safety. Should you find yourself in the water, avoid panic. Air trapped in clothing can provide buoyancy as long as you remain still in the water. Swimming or treading water will greatly increase heat loss and can shorten survival time by more than 50%. The major body heat loss areas are the head, neck, armpits, chest and groin. If you are not alone, huddle together or in a group facing each other to maintain body heat. Proper preparation is essential when boating on cold water. Make sure your boat and equipment are in first class condition. Check the weather forecast before leaving for your event. Always tell someone where you are going and when you expect to return. Dress in several layers of light clothing. Next to a diver’s wet suit, wool clothing offers the best protection. Always wear a personal flotation device (PFD) when boating. Treatment for hypothermia depends on the condition of the person. 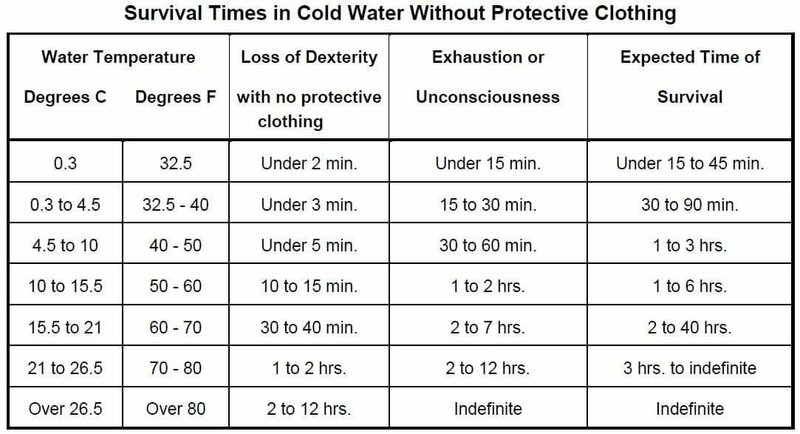 Mild hypothermia victims who show only symptoms of shivering and are capable of rational conversation may only require removal of wet clothes and replacement with dry clothes or blankets. In more severe cases where the victim is semi-conscious, immediate steps must be taken to begin the rewarming process. Get the person out of the water and into a warm environment. Remove the clothing only if it can be done with a minimum of movement of the victim’s body. Do not massage the extremities. Lay the semi-conscious person face up, with the head slightly lowered, unless vomiting occurs. The head down position allows more blood to flow to the brain. If advanced rescue equipment is available it can be administered by those trained in its use. Warm humidified oxygen should be administered by face mask. Immediately attempt to rewarm the victims body core. If available, place the person in a bath of hot water at a temperature of 105 to 110 degrees. It is important that the victim’s arms and legs be kept out of the water to prevent “after-drop”. After-drop occurs when the cold blood from the limbs is forced back into the body resulting in further lowering of the core temperature. After-drop can be fatal. If a tub is not available, apply hot, wet towels or blankets to the victim’s head, neck, chest, groin, and abdomen. Do not warm the arms or legs. If nothing else is available, a rescuer may use their own body heat to warm a hypothermia victim. Never give alcohol to a hypothermia victim. These symptoms, it was discovered, did not always mean the victim was dead. They were, on the other hand, the body’s way of increasing its chances of survival through what scientists call the mammalian diving reflex. This reflex is most evident in marine mammals such as whales, seals or porpoises. In the diving reflex, blood is diverted away from the arms and legs to circulate (at the rate of only 6-8 beats per minute, in some cases) between the heart, brain and lungs. Marine mammals have developed this ability to the point where they can remain under water for extended periods of time (over 30 minutes in some species) without brain or body damage. Facial immersion – the pathways necessary for stimulating this series of responses seem to emanate from facial cold water stimulation. The diving reflex is a protective mechanism for humans in cold water immersions, but it may confuse the rescuer into thinking the victim is dead. Resuscitative efforts for these victims should be started immediately utilizing CPR in accordance with your training. Remember, numerous children have been brought up from freezing water after 30 minutes and been successfully resuscitated.